Southern Laos bicycle tours: cycling and biking in Pakse, Khon Islands, Bolaven. The Land of a Million Elephants, as Laos was once known, is opening up to tourists after years of war and isolation. Consequently, a visit to Laos is like stepping back in time and the citizens have retained innocence and charm that is as rare as it is valuable. The mountains and rivers are pristine in this land-locked country, squeezed between China, Burma, Thailand, Cambodia and Vietnam. As part of Indochina, Laos was colonized by the French and the cities of Vientiane, Luang Prabang and Pakse have inherited the classical, elegant, if little faded, character only French architects can inspire. Although Laos has some genuinely interesting attractions to offer - the Plain of Jars in Xieng Khuang Province, the forested mountains of Northern Laos, the gothic limestone karsts around Vang Vieng and Si Phan Don (Four Thousand Islands) where the mighty Mekong spreads in the Southern Laos - it is the warmth and sincere friendliness of its people that will live forever in the hearts of anyone fortunate enough to visit. Our Southern Laos tour is a sojourn along the Mekong River to the former colonial outpost of Champasak, the serene beauty of Si Phan Don and the rich fertile lands of the coffee growing Bolevan Plateau. From the natural attractions of amazing waterfalls to the rare Irrawaddy dolphins and to the cultural Khmer temples of Wat Phu, this tour explores the quiet back roads of South Laos. Start in Ubon Ratchatani for a transfer to our hotel on the banks of the Mekong River. A short transfer takes us to the Lao border at Chongmek, and we start to cycle on a flat tarmac road, passing through colonial Champasak to Wat Phu, a Khmer Hindu temple complex dating back to the 5th century. We catch a ferry to Don Daeng Island for a short ride in the morning. Then another ferry trip to Ban Niet Ngong and either ride or walk up to see Phu Asa, a curious site of stone towers. In the afternoon, we ferry to one of the biggest of the islands in the Mekong, Don Khong. We island hop, taking ferries and cycling from Don Khong to Don Som to Don Det to Don Khone. We rest as we cruise by boat to try and sight the nearly extinct Irrawaddy dolphins. After a visit to Phapeng Waterfalls, it's time to head up to the coffee growing area of Laos: the Bolaven Plateau. We stop for lunch at Tad Fane Waterfall. Then it's on the bikes to cycle to our coffee resort. We ride to Tha Teng on a quiet tarmac road through small villages and stop at a Katou village to see how they roast coffee before we ride downhill to Tad Lo Waterfalls and our riverside overnight. Afternoon is free to take a dip in the waterfalls. We leave the Bolaven Plateau on an undulating road with a few surprises and stop at another impressive waterfall, Tad Pha Suam. We then transfer to Pakse for a rooftop farewell dinner. Drive back to Thailand for your onward travel. Ride and scenery were great, staff was exceptional. We really did like the trip. 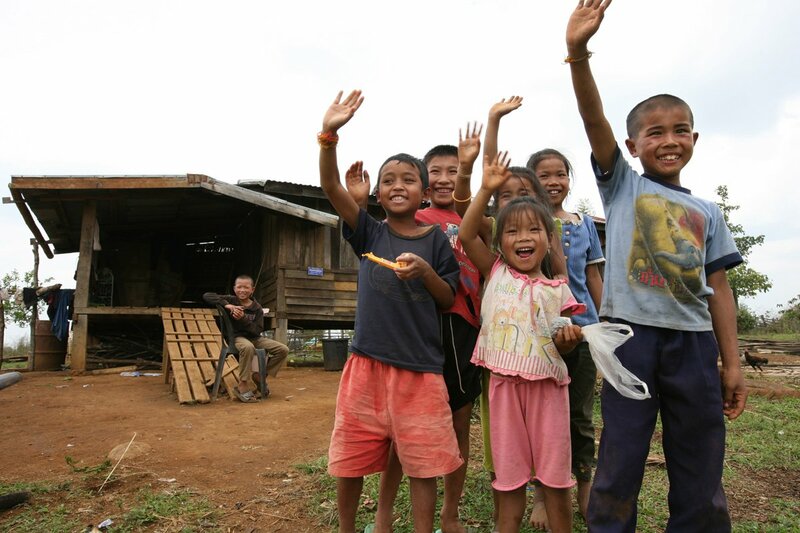 Southern Laos was poor, friendly, charming an safe. Excellent guide and driver, good cycling on tiny roads which would have been absolutely impossible without the guide. This was our fourth cycling tour with SpiceRoads, and we had yet another fabulous experience. They really do a great job of minding all the details, so you don't have to. We have had several great guides with SpiceRoads, but Sone really raised the bar. Cheerful, enthusiastic, and hard-working, she really impressed us with her dedication and professionalism. She is definitely a "10". Our biking sojourn takes us through the Southern Lowlands from Pakse down to the Cambodian border before heading north and then east to the fertile lands of the coffee rich Bolaven Plateau. We cover up to 262 km in 6 cycling days, and much of the terrain is quite flat except for the days up on the plateau. There are some great natural attractions and the chance to spot the rare Irrawaddy dolphins makes this one tour that has absolutely something for everyone. Along the way, the scenery is constantly changing: we go from arid scrubland to jungle to lush green valleys. The views at some of the places we stay are absolutely amazing, and this, combined with the changing scenery, make this tour a feast for the eyes. Apart from cycling, we take time out to see 5th century temples of Wat Phu, some wonderful waterfalls, visit one of the best coffee growing areas in the world, and hopefully are lucky enough to sight the elusive Irrawaddy dolphins from one of the Mekong's 4,000 islands. Suitability: This ride is a great one for novices and experts alike. Most of this ride is flat apart from the end of Day 5 and the start of Day 6, and it undulates on Day 8. The road surfaces are generally very good and so make for easier riding. Anyone who has moderate fitness will enjoy this tour. If you are in doubt, please contact us for advice or a list of references. Biking Conditions: The road surfaces are mixed: most days we ride on reasonably good quality asphalt roads, but there are enough rides on very badly broken or dirt tracks to mean you will need a mountain bike, preferably one with front shocks. However, there is nothing technical involved on this tour, and anyone, assuming they are fit enough, will be able to join no matter how little cycling experience they have. A support truck is always available to help when required, except on Day 4 when we ride on the islands. The start point of the tour is Ubon Ratchatani, and you can travel there by plane or train from Bangkok. We have one group transfer to our hotel on the banks of the Mekong River. Please inform us of your arrival time. We have our trip briefing and dinner in the early evening on the bank of the Mekong River. It’s a short transfer to the Lao border at Chongmek, and once visa formalities have been completed, we drive about 1 hour to the start of our ride. We start cycling on a flat tarmac road, passing through the former colonial town of Champasak, which stretches along the Mekong River. We ride 8 km to Wat Phu, a Khmer Hindu temple complex dating back to the 5th century. Here, we have a picnic lunch and explore this fascinating place before we head back to Champasak and overnight at our riverside resort. We start the day with a short cycle to catch a ferry to Don Daeng Island, and we go for a short ride around the island. Then we take a ferry ride to the other side of the river and ride to the village of Ban Niet Ngong. Once we reach the village, we can opt to ride or walk up to see Phu Asa, a curious site of stone towers. We have lunch and then ride back down to the main junction before we load up the vans for a transfer to Ban Hat. Here, we cross back over to the Mekong to one of the biggest of the islands in this mighty river, Don Khong. Arriving in the late afternoon will give you time to walk along the river and watch as the locals make full use of the river. Today, we island hop! We have an early start and ride around Don Khong and along the river banks to the ferry, stopping to see locals making palm sugar. When we reach the ferry, it's only 200 m to the island of Don Som, one of the longest islands in the Mekong, stretching about 12 km to where it meets the tip of Don Det. It's another quick ferry ride to Don Det, and we cycle along a dirt path to an old French Railway bridge and cross over to Don Khone for hotel check in and lunch before continuing to a leisurely cruise in search of the nearly extinct Irrawaddy dolphins. We visit Leepi Falls and see the Mekong River channel on our way back to the hotel. A varied ride over four islands on narrow dirt tracks means there’ll be no vehicle support, but we will still stop for water and snack breaks. After breakfast, we ride a short distance to the ferry to cross the Mekong again. It's a short 12-km ride to Khan Phapeng Waterfalls. This natural phenomenon splits the Mekong. After you've taken your photos, we transfer for about 2 hours to begin our journey into the coffee growing area of Laos: the Bolaven Plateau. We stop for lunch at Tad Fane Waterfall. Then it's on the bikes to cycle to our coffee resort for an overnight. We start with a gentle uphill of 10 km to the town of Paksong. Then the road evens out before we roll down to the resort. We ride on to Tha Teng on a quiet road, passing villages and lots of cheering children. After lunch, we hit a very quiet road, watching out for piglets crossing, and stop at a Katou village to see how they roast coffee and learn why there are empty coffins under the houses. Then it’s an easy downhill. From the junction, it’s only 5 km to Tad Lo Waterfalls and our riverside over-night. The afternoon is free to take a dip in the waterfalls before we have an alfresco dining experience overlooking the falls to round off a great day. As we leave the Bolaven Plateau behind, we ride on an undulating road that has a few surprises – some lengthy but gradual climbs, one is 5 km, another 14 km. We ride 52 km to Tad Pha Suam, where we can see different styles of traditional Laotian homes and another amazing waterfall. We then transfer an hour to Pakse to take in this riverside town. We have our farewell dinner on the roof of the Pakse Hotel. We drive back to the border and cross into Thailand for a 11:00 am arrival in Ubon Ratchatani, in time to catch afternoon flights. Because some people can't imagine going on a trip without their own beloved bicycle, we do not provide them as part of this tour. However, you can hire bikes locally for the price listed in the tour pricing section. The bikes are well-known makes of mountain bikes with lightweight alloy frames, 24- to 27-speed gearing, v-brakes and Shimano components and front suspension. If you bring your own bike, please make sure it is a mountain bike, preferably with front suspension, and that it is in good mechanical order. All nationalities require a visa for Laos. A 30-day visa on arrival can be obtained at all airports and all land border crossings. Fees vary depending on country – US$42 for Canada, US$35 for the USA, UK and most of Europe, and US$30 for Australia and other countries. You’ll need a passport photo, an application form and US dollars for the visa fee. A visa issued at a Laos consulate abroad is valid for 60 days. When entering Laos with a visa please be sure to obtain an immigration entry stamp. Entering the country on only a visa, and not the proper immigration entry stamp, could subject you to fines and/or penalties. We recommend that you visit a travel medical doctor and ask about the following vaccinations: typhoid, polio, tetanus and hepatitis A. A certificate for Yellow Fever is required when arriving from an infected area within six days. 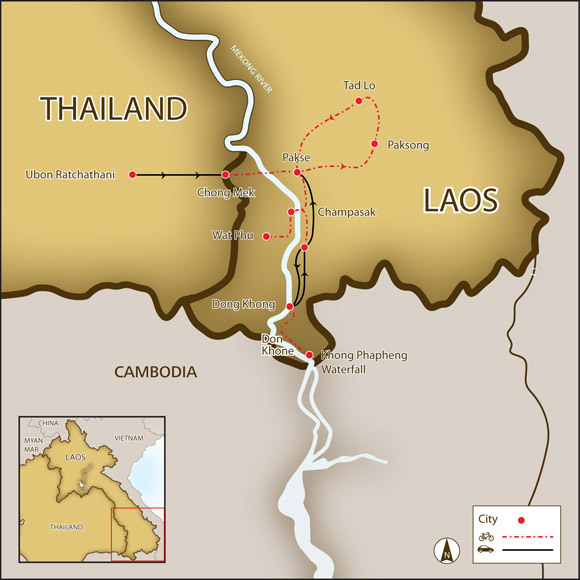 Laos has a tropical climate with fairly high humidity. There are three seasons: from March to June it is hot and dry, with temperatures between 27C and 40C (80-104F), with night temperatures in the 20C/75F). The rainy season is from June to October. The cooler season, is from November to February, with average temperatures between 20C and 30C (70- 86F). It can get a little cold at night at higher elevations year round so bring a light fleece for the evenings. Meals are included as per the itinerary where B = breakfast, L = lunch, D =dinner. Most meals are local Laos food and feature noodles, curries and soups. Lao cuisine is very similar to Thai food and we make sure you sample as much variety as possible. Any special dietary requirements can also be catered for as well. Please let us know at the time of booking. Keeping you completely hydrated is a job we take very seriously. Cold water, some energy-restoring local fruit and soft drinks are included in the tour price while riding. Soft drinks and other beverages during meals are not included. Beer is freely available everywhere, but is NOT included in the price. SpiceRoads does not require you to pay a surcharge for travelling alone. We will arrange for you to share accommodation with another traveller of the same gender and if we can not match you up we will provide a single room at no extra charge. If you prefer not to share a single supplement is payable to guarantee your own room. The cost of the single supplement is listed above. The official national currency in Laos is the kip, however, Thai baht and US dollars are also used, especially in larger cities and towns. In smaller towns and villages, kip is usually preferred. There are now a few ATMs in Laos, but they are not widespread and are operational only sporadically. The best overall exchange rates are those offered at the BCEL (Banque pour le Commerce Extérieur Lao). Licensed moneychangers rates are similar to banks Spend all your kip before you leave as no one will exchange it for you once you leave the country!